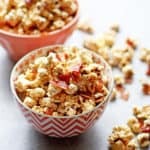 The flavors are perfectly sweet and salty resulting in an addictive movie night snack or Super Bowl treat! Pop 8 cups of yellow kernel popcorn according to instructions and add to a large bowl. Set aside. Preheat oven to 450 degrees. Add bacon to a baking rack over a baking sheet and bake for 15-20 minutes or until crispy and golden brown. Save bacon drippings. Once bacon is cool, break bacon into small pieces or cut into small pieces. In a medium sized pan, melt butter over medium heat. Allow butter to brown until tiny brown specks appear and a nutty aroma develops. Once butter has browned, turn heat to low and whisk in maple syrup, half of the bacon drippings, half of the bacon bits and salt. Pour butter syrup over popcorn and fold over to evenly coat. Add remaining bacon on top of the butter and serve.